By now, you have all probably heard about the Google+ project, Google’s next attempt at making their network more social. Its goal is to make sharing online more like sharing in real life. If you haven’t gotten your invite just yet, you can learn more about Google+ in the following quick-look video, and by visiting the Google+ project overview, searchable details and discussion pages. You can also take a demo tour so you can get a feel for what to expect once you are able to join the project. If you’re one of the lucky ones, you received an invite for Google+ during their limited field trial. While the invite messages ranged from a sneak preview of what will be inside to your friend is hanging out, the commonality is the brick-red Learn more about Google+ button. 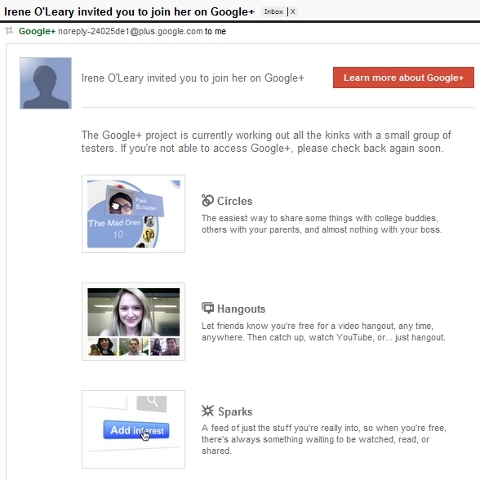 Here is an example email invite to Google+. Whenever you click on the button, you’re taken to the invite screen for Google+. If you have a Gmail address, all you have to do is update your public profile to begin. Join Google+ when someone sends you an invite. There is also a checkbox that says “Google may use my information to personalize content and ads on non-Google websites.” When you click on the question mark for more information, it takes you to the privacy notice about +1 on non-Google sites which lets you know that when you enable +1, you will be able to see recommendations by your friends in Google+ and they will see your recommendations based on the +1’s you have clicked. +1’s will show up on your Google public profile which you should fill out if you are planning to start interacting more on Google networks. 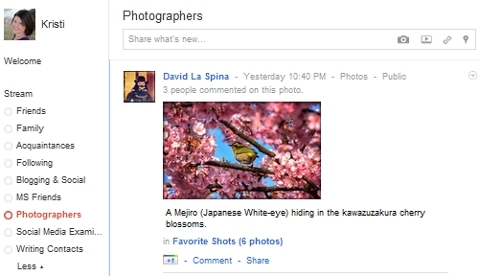 The first question you are greeted with is a popup on whether you want to link your Picasa Web Album (Google’s version of Flickr) to your Google+ account to share your photos and videos with others. If you have albums already, the privacy settings for them will remain the same. Since I do photography, I went ahead and connected mine. It’s also a bit confusing as your only other option is Don’t Join Google+. Next, you will be greeted by the Welcome screen. 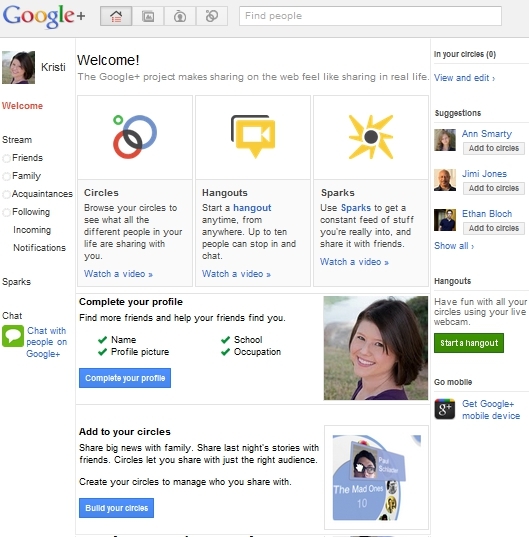 Google+ greets you on your first visit with popular options. The first thing you will want to do is click on your name in the black bar across the top of the screen and view your profile. 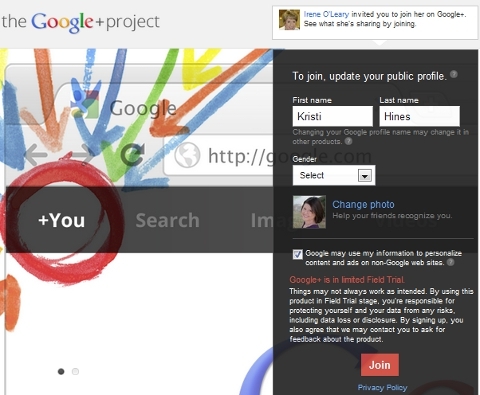 Edit your Google+ profile so connections can learn more about you. 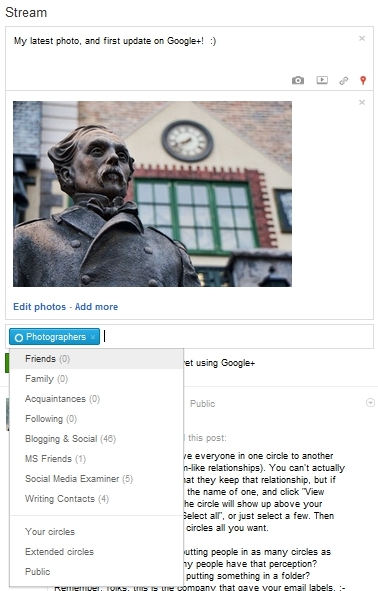 Here you will be able to edit your Google+ profile information, including adding a tagline, employment information, education and photo scrapbook. You can also set the privacy on each one of these to anyone on the web, extended circles (friends of friends), your circles or only you. When you click on Continue to my profile, you will see your full profile which will pull your Google+ updates on the Posts tab. 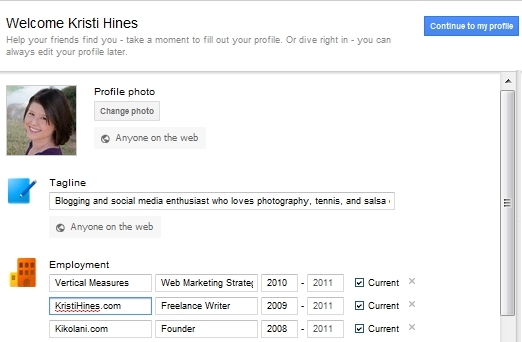 View your complete Google+ profile and make edits where necessary. Your About tab pulls information from your main Google profile; you can also edit that here by clicking on Edit Profile and then clicking on the section you want to edit. Under Photos and Videos, you will see anything you allowed to be imported from Picasa. Next are your +1’s and Buzz updates. Next, you will want to start adding people as connections. Click the Show all > link in the right sidebar under Suggestions to see the friends you have already on Google+. It may be limited during the trial, so don’t be surprised if you don’t have many. Add friends from your Google connections and see who has added you to their circles. From here, you can find people based on who you connect with on Google—people you have emailed in Gmail who also have Google accounts, people you follow on Google Buzz and so forth—using the Find and Invite tab. You can also see who has already added you to their connections by using the People who’ve added you tab. Want to know about a particular person? Just click on their box and then the link to their profile where you can see (based on their privacy preferences) their latest updates, people they have added to their circles, people who have added them to circles, and people you have in common between your circles. Circles are the way to organize your connections on Google+. Learn more about them in this short intro video. The default circles you have are Friends, Family, Acquaintances and Following. You can drag people into circles individually or by highlighting multiple people at a time and dragging them all into one circle. You can also create a new circle by dropping a friend onto the Drop here to create a new circle or simply hover over that circle to create a new one before you start dragging your connections over. Create new circles for different connections. When you add your first person who has already added you to a circle, you will get a popup notification that you can now share with them and see what they are sharing with you. They will be notified that you added them, but not see the name of the circle you added them to. You will also be notified that they will appear on your public profile. If you don’t want that to happen, you can click on the Change link which will take you to your Google profile with a highlighted box where you can change the visibility settings to show people in all circles or just selected ones, select whether anyone on the web or just people in your circles can see that information and select whether to show people who have added you to their circles. For the people who are not on Google+ yet, adding them to a circle means that you will be able to send them updates via email. I have added people not on Google+ to circles in the hopes that when they do join, they will already be organized where I want them. I’m not sure how I feel about sending them updates because those people haven’t signed up and might not really want to be opted into updates, but regardless it is there for those who feel that someone would be interested in the updates. Before you go too far into Google+, you might want to tweak some of your settings. To do this, click on the Options symbol all the way to the right in the black bar across the top of the screen. 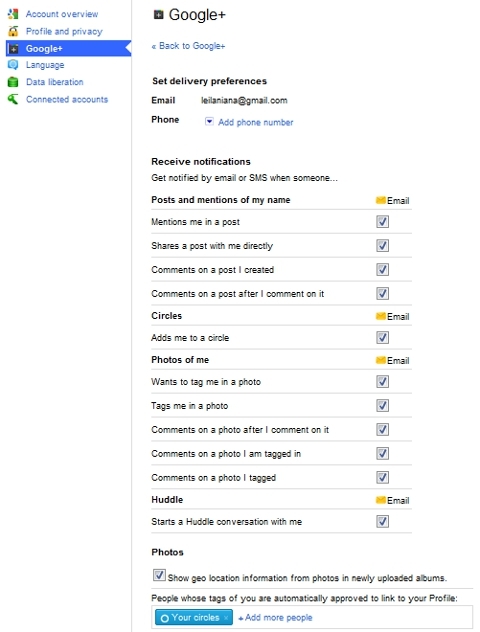 Manage your Google+ settings, including notifications, geolocation and tags. Here you can set what notifications you receive. After that, there are two important settings you will want to note. Photos and Geolocation Information—If you don’t want a location tagged to your photos, you will want to uncheck this one. I haven’t seen any location tags on a photo yet, but I once uploaded a photo to a Twitter photo sharing service that tagged the photos on map view, so if you took a photo of your house, you would be giving the world directions. People Whose Tags Are Automatically Approved to Link to Your Profile—A network where not everyone can tag you! If you keep your connections organized well, only people you want to tag you can, as you can set this to particular circles, extended circles, all of your own circles or public. When there is new activity for you on Google+ (someone shares a post with you, adds you to their circle, etc.) then a red number will appear next to your name in the black bar across the top of the screen. 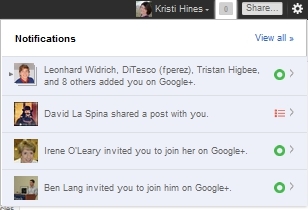 See your latest Google+ notifications. You can click on these individual items to see more details about them or go directly to posts that have been shared with you. Once you have set up your profile, added people to your circles, and adjusted your settings, you can go back to your main page by clicking on the Home icon to see a stream of updates from your connections. Read the latest updates from your Google+ connections. You can see updates from all of your connections, or click on the circle names in the left sidebar to see updates from just people in those circles. Also, for each individual update, you can click on the down arrow to the right of the update to link to the post and share it on your profile, report it as abuse, mute the post or block the person who sent it. 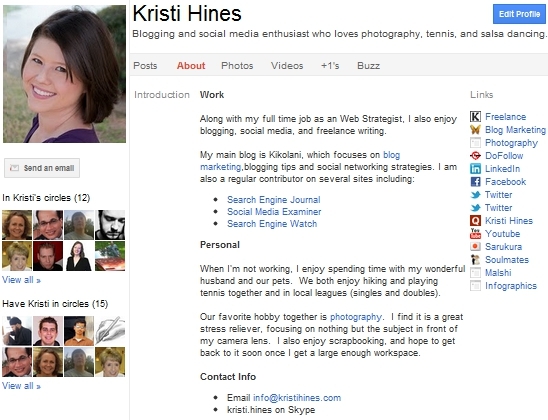 You’ve seen the implementation of Google +1 on blogs, websites and in search results. Here’s where it comes into play within Google+. Just like you can Like posts on Facebook, you can +1 posts! Give a +1 to your favorite posts in your stream. You can also see the count of how many +1s the updates receive and who has given it the +1. To send an update, you click on the box right below your stream. You will have the option to send photo-, video-, link- or location-based updates. Send updates to the public, all of your circles or only specific circles. You can then select who will see this update among your different circles, all of your circles, extended circles or anyone on the web. 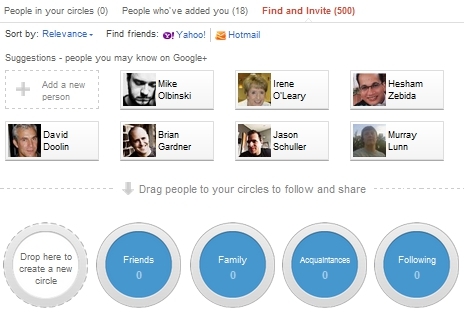 There is also an option to email your updates to people you’ve added to circles if they are not a part of Google+ yet. Again, I’m not sure how I feel about opting-in someone who isn’t even a part of the network yet, but it’s there. In your left sidebar, you have an option to connect with people in Chat. It’s similar to the same chat feature in your Gmail, also known as Google Talk. Google Talk is now inside Google+. The indicators will show you if someone is online and if they are available for a text chat (the green dot) or a video chat (the green video camera). When you click on their name, a little chat window will pop up at the bottom right side of your screen so you can start chatting. Start a text, video, phone or group chat. From here, you can click on the video icon, phone for Google Voice chat or the + person icon to add more people to start a group text chat. And if you want to start blocking someone, just click on the Actions dropdown for that option. You can set your Google+ chat to only show you as online to particular circles, or you can set your overall status to Available, Busy, or Invisible to everyone signed into chat. Since I’m not quite comfortable with video yet, I haven’t gotten into this one. But you can connect with people via video by clicking on the Start a Hangout button in the right sidebar of your home page. You can learn more about this feature in this quick video. You will need to have a webcam and install the Google Voice and Google Video plugins to use this feature. 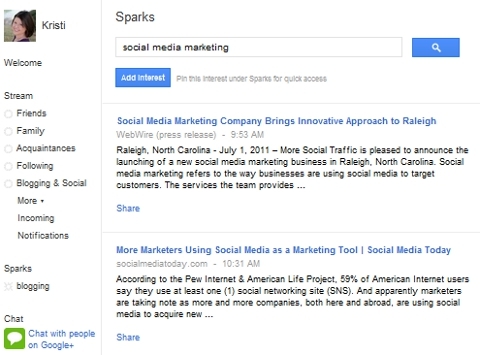 Sparks is a feature within Google+ that allows you to get a feed from a variety of websites on any topics you choose. 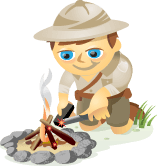 Simply search for the things you are interested in to bring up a feed for that interest. Check out the latest news in your industry with Google+ Sparks. When you click the Add interest button at the top of a search, it will save it for you in your left-hand sidebar under your streams for easy access. It’s a great way to catch up on news on your favorite topics or within your industry. It also gives you some quick content to share with your circles! Last but not least, you can access Google+ on your mobile device. Currently the only app is for Android, with iPhone coming soon. But you can access google.com/+ in your browser on Android, iPhone, iPad and Blackberry with the specified OS systems. What do you think? 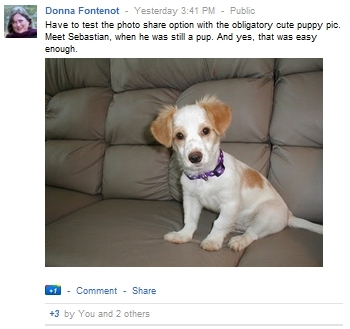 This article contains everything I know about Google+ thus far. Have you joined? What has been your experience so far? Do you think you will use this more or less than other social networking platforms? Please share your thoughts in the comments!